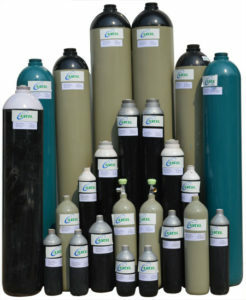 We are a renowned Xenon Gas supplier, dealers and exporters in India. Xenon Gas is tasteless, odorless, colorless, nonflammable Inert / Noble gas present in atmosphere at a very low concentration in PPB range making it highly expensive. It has got a boiling point of -108.1°C (-162.5°F). Xenon is majorly available in earth’s atmosphere near to the source of minerals along with other components. The Xenon is extracted from atmospheric air using Cryogenic Distillation/air separation plants by using fractional distillation techniques and generating pure Liquid Oxygen first. This Liquid Oxygen contains Krypton and Xenon. Further distillation and by using silica gel, Kr and Xe gets separated from liquid oxygen and then Kr and Xe are separated by further distillation process making it every expensive gas. The gas produced by this method is further stored in Xenon Gas Cylinders for any industrial/lab grade applications. Xenon Gas can be made available in high pressure carbon alloy steel cylinders or aluminum cylinders. Xenon is a highly expensive and very less available gas. It is available mostly in its purest form only. We have in house laboratory equipments to check the level of purity as well as various impurities present in it. Due to its almost non reactive nature at normal room temperature and atmospheric pressure, its major use is in lighting industry in pure form or when mixed with Argon. In lighting industry in fluorescent tubes and laser lights. In photography used in high speed flash lights as a white light source. In sodium lamps as a starter gas. In medical services as anesthetic gas. In manufacturing of flat panels. These are some of the common uses of Xenon. There are various other ways in which Xenon can be used in a particular industry or process.